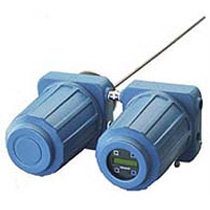 The OCX 8800 with its rugged design, stable sensor, electronics and software package, is the most dependable oxygen/combustibles transmitter on the market. The time-tested and world renowned zirconium oxide sensor is the basis for the oxygen measurement. This, coupled with the new combustibles sensor can detect oxygen and combustibles concentrations in flue gases with temperatures up to 2600°F (1427°C). All information from the analyzer is updated constantly and provided to the operator or technician. Low cost to maintain.